It may be imperfect but it’s something. Action for Transport 2010, from which the Epping-Parramatta railway emerged, was aimed at joining up the network. The Parramatta council’s study was focused on improving connectivity to its CBD and it viewed the world through that prism. Finally, the State Government’s study focused on corridors with the highest redevelopment potential. In synthesising the options Transport for NSW has failed to prioritise the network benefit of joining up disparate pieces of infrastructure. Still, we’ve ended up with two starter lines, not one. We’ve ended up with a formal commitment to raising infrastructure funding through value capture. They’re all big steps forward. The obvious oversight is the 3.5km gap between Carlingford station and Epping Station. Nearly one-third of Sydney lives north of the river/harbour but the new metro doesn’t connect to Parramatta nor does the northern line. Sure, it will be easier to add this short link later after the Carlingford line’s conversion to dual-track light rail – as long as it’s included in the planning. It will need a short underpass under Pennant Hills Road; the link lies in its entirety on the Carlingford Road reservation, long ear-marked for road widening. The complexity is getting the interchange right at Epping to allow simple transfer to the northern line and the north west metro. Yet it is solvable. In the meantime, it remains a missed opportunity that could have transformed housing/job accessibility over a wide slice of the metropolitan area. A start, nonetheless. Not quite as it seems re the Randwick Council report leading to light rail in the south-east. There were no less than 78 reports into city and Anzac corridor light rail before there was action, most commissioned by various state governments and the biggest single study was by the City of Sydney. Nothing happened there overnight. Clearly now the Hills Council is going to have to join with business (to replicate the work of the West Line Alliance) to invest in a highly detailed evaluation of the next stage to Epping. @Robertybob – I broadly agree with your assessment, though to be fair to Parramatta Council its proposal while obviously putting Parramatta at the centre of the network was also about improving connectivity within the region and also providing circumferential links between the radial corridors in the northwest, west and southwest. Council put a lot of work into the proposal and its preferred option as the first priority was originally a route to Macquarie Park via Eastwood, not Epping via Carlingford, and did not necessarily involve taking over the Carlingford line. As a route this made a lot of sense as it connected directly to Macquarie Park but avoided adding to the complexity of adding another mode to the Epping interchange while still connecting to the main north rail line and the metro and also adding a direct link between Eastwood and Macquarie Park. Unfortunately for a number of reasons the original proposal was quietly dropped and the two-volume feasibility report has been removed from Council’s website (incidentally Bambul this means that the links to the report in your post are no longer live, but you can still access it using Wayback). The Epping via Carlingford route was chosen instead as the council’s preferred option. I also agree that the proposal announced by the government can be seen as a glass half full/half empty debate. The Olympic line was certainly not rated the highest priority by council but clearly the state government wants to use it to drive new development which it sees as a priority over intra-regional connectivity, with the added bonus that this development can help fit the bill. I wrote earlier that I didn’t have a problem with this, provided the government then used its contribution for the Parramatta to Epping/Macquarie Park link. Unfortunately we haven’t quite got there. I think the government sees the Carlingford option largely as a convenient way to solve the “problem” of the current heavy rail link, though given the current poor patronage it’s hard to see the economic rationale unless the line is extended to Epping or there is a lot of high density development, or both. But you are right – while this is a missed opportunity, we do get one complete route and half another. As you suggest the important thing to do now is to ensure that the missing link is preserved and that a strong case is made for its construction as soon as possible. Correction – that should be “foot the bill” in the fourth paragraph of my post, not “fit the bill”. Links often become broken, unfortunately. So many that I just don’t bother to correct them. However, I have gotten into the habit of saving documents to my computer and backing them up to the cloud for this very reason! @robertybob – To the best of my knowledge, there is no plan to widen Carlingford Rd and there never has been. Any road widening which would be needed to accommodate the light rail extension from Carlingford to Epping would require part resumption of properties along the length of the road, which was not previously planned. There is a current proposal to upgrade the Beecroft Rd and Carlingford Rd intersection in Epping and there is no mention of widening Carlingford Rd. There is also a plan to widen Epping Rd on the eastern side of the rail line by providing an additional westbound lane. It will be used exclusively for westbound traffic turning left into Blaxland Rd. There is no plan to widen Epping Bridge. Major multi-storey redevelopments are proposed on both sides of Epping Rd, so there is no prospect of any further road widening to accommodate light rail. Contrary to your assertion, the complexity of running a light rail line either to or through the congested Epping Town Centre is not solvable. The only option would be to go underground and that just wouldn’t be viable for light rail. All of the indications are that there is no intention of extending the light rail route through Epping. My belief is that a future extension to Macquarie Park will revive Parramatta Council’s original preferred first stage via Eastwood, which is the most direct route along an existing reserved transport corridor. It would branch from the Carlingford Line at Dundas onto Kissing Point Rd and run along an existing 6-lane corridor and the Eastwood County Rd reservation direct to Macquarie Park. Property resumptions would be minimal and would be mostly to buy up the remainder of properties not already owned by RMS along the County Rd corridor. Think about it. There is no reason why a Macquarie Park route has to go through Epping. The more direct route via Eastwood also interchanges with the Northern Line and the North West Metro at Macquarie University. It also provides a new high capacity transport corridor. It is still a mystery why Parramatta Council’s preferred first stages in their feasibility study to Macquarie Park via Eastwood and Castle Hill via Windsor Rd didn’t even make the shortlist of options in the State government’s assessment. I’d give a lot more credence to that study than the current process. The fact that the original feasibility study is no longer assessable on Parramatta Council’s website suggests that there’s been a bit of heavying going on behind the scene. But I can see a lot of potential. Combining the Olympic, Carlongford and Westmead means that at least some of the the key problems are coveres i.e. tyhe routhe through Parramatta CBD, the eastern approach to the CBD and where and hpw to cross the River. A CBD-Camelia-Rydalmere truck can provide a good basis for future expansion in several directions – via Clyde link and on to Bankstwn; east from Rydalmere along Victoria Road – ultimately linking up with the inner west line(s); and northeast to the Northern and Metro lines (whether via Carlingford-Epping or the “Ray route” via Dundas-Epping-Macquarie – which although preferable doen’t rule out the beneft of a Parramatta-Carlingford connection); and even the long awaited Windsor Road link. @JC – Just to correct you, my preferred option is from the Carlingford Line at Dundas to Macquarie Park via EASTWOOD, which was Parramatta Council’s original preferred route. No one seems to want to acknowledge that Eastwood exists. It’s as if it’s a no go area. Sorry Ray – I understand your proposal – it was slip of the pen/lack of concentration. I agree with your analysis – especially about the route availability via Eastwood – but there there is an understandable tendency to (wrongly) favour the Carlingford-Epping route because of the seemingly short gap that needs filling. @JC – I agree that the short gap from Carlingford to Epping is probably part of the rationale for the initial choice of this route, but as I said before I think one of the main reasons the government chose the Carlingford option was to solve the “problem” of the current under-utilised heavy rail route. @JC & Alex – Yes, I agree with you that the short gap between Carlingford and Epping would appear to the uninitiated to be a logical option to complete the link, just as it was with the original PERL concept, instead of adopting the more direct route via Eastwood. The desire to fully utilise the existing Carlingford Line infrastructure was the overriding factor, even though it is longer (by 3km). It was also cheaper than the Eastwood route, according to the government of the day, which would mainly have to be in tunnel as far as Dundas, where it would surface to connect with the Carlingford Line. There were never any publically released estimates to compare the relative costs of the two options. Remember, this was under the Labor Government at the time. The Eastwood option also included a ‘Y’ link from Epping to Eastwood which would have allowed for direct services from the Northern Line to Parramatta. If the Carlingford Line didn’t exist, there may have been a different outcome. Similarly, it has been assumed that the light rail route from Parramatta to Macquarie Park should adopt the Carlingford Line and the ‘short’ gap between Carlingford to Epping, which I admit appears to be a logical choice. However, what has been overlooked is that this is a surface route, unlike the PERL, and there are insurmountable problems in constructing a light rail link along existing 4-lane roads through the Epping Town Centre. It would also be a waste of resources in constructing a light rail link from Epping to Macquarie Park when it would only duplicate the existing rail link. Although Parramatta Council has inexplicably been favouring a light rail route via Carlingford and Epping, contrary to its own feasibility study, this option was eliminated in the early stages of the investigations for reasons already expressed. The favoured and more direct route was via Eastwood along an existing reserved transport corridor which makes complete sense. Anyone suggesting property resumption along Carlingford Road to accommodate light rail hasn’t driven along it recently. Resuming new five storey apartments may not quite work. Similarly, if the Light Rail gets to Epping, it will be unlikely to duplicate the Metro (especially due to traffic issues in the Town Centre noted above). The low patronage on the Carlingford line is a function of the frequency (1 per hour) and connectivity at Clyde. Most would likely take a bus. The reason the service is going to Carlingford is in part to manage the infrastructure issues created by The Hills and Hornsby councils dumping apartments in the area. Many of the proposed light rail lines is they are to be built along major roads and would require two traffic lanes to be removed from congested roads such as Old Northern Line and Carlingford Rd. That said unless the Camellia industrial area becomes highly populated, the light rail to Olympic Park will be a white elephant. Agree Anthony. Just as it is inappropriate to build the light rail route along the 4 lane Carlingford Rd, requiring significant resumptions to widen the corridor, it is also inappropriate to run a Castle Hill Link along the 4 lane Old Northern Rd for the same reason. Parramatta Council’s feasibility study recommended that the Castle Hill route should follow Windsor Rd through Baulkham Hills to Victoria Ave then Showground Rd to the Castle Hill Town Centre. All of these roads are already 6 lanes or capable of being widened to 6 lanes with minimal resumptions. The Old Northern Rd route was nominated as an alternative. Although it is more direct, it is doubtful if it would be preferable because of the wholesale resumptions and disruption that would eventuate, when the Windsor Rd/Victoria Ave/Showground Rd option would be more acceptable, particularly as it is likely to attract greater patronage. I still have my doubts about the wisdom of selecting the Sydney Olympic Park route as the first priority, although it would certainly be warranted in the longer term. It will still be many years before development of the Camellia Precinct reaches the stage when patronage levels justify the building of the light rail line. In the meantime, the State Government will effectively be underwriting the operating costs for the benefit of developers along the route in the early development phase. 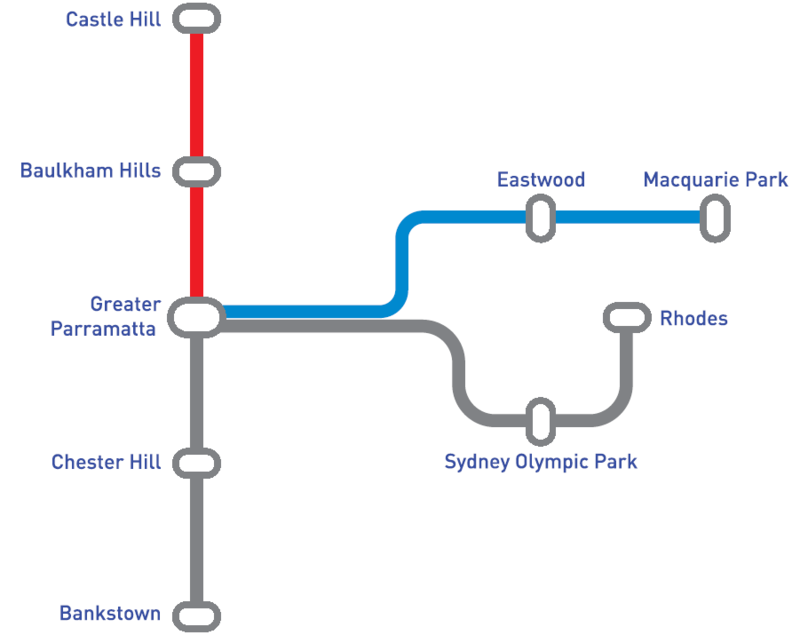 It would have been more prudent to build the Macquarie Park and/or Castle Hill routes as the first stage of the light rail network (as recommended in Parramatta Council’s feasibility study) as there would be an existing demand for the service generating an immediate return on investment. As development intensifies along the Sydney Olympic Park corridor in the future (it’s not going to happen overnight), a light rail link would then be warranted as the next stage. It’s hard to justify it otherwise. No more light rail should be constructed until it is shown construction costs can be got under control! Paying close to $100 million/km for light rail is what overseas countries pay to get underground metro or HSR. Would there be any benefit to the community for light rail in Parramatta, or would it be cheaper and more beneficial to use electric buses, or existing buses? Operational capacity of light rail is far less than crush capacity – a recent study of the inner west light rail revealed only 140 passengers on average for each tram packed to capacity in peak or only 1050 passengers an hour with an 8 minute headway. Buses using the same corridor would be much cheaper, faster, quieter, convenient, safer, etc etc etc. 1. Speculation of cost blow outs. 2. 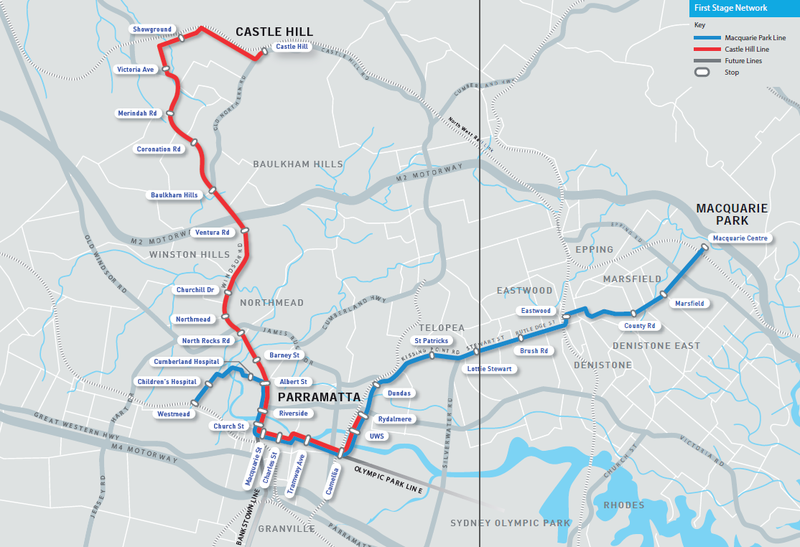 Duplication of light rail and rapid metro between Parramatta and Olympic Park. 3. How would passengers be transported between heavy and light rail to and from ferry wharf at Olympic Park especially during low tide on Parramatta River? 4. The question of Rosehill heavy rail after Carlingford line cut at Camellia. Unclear if there would be a light rail stop at Rosehill. Either way I think Rosehill heavy rail station would be negatively affected if unincorporated into the light rail project. 5. Speed and frequency for a line feeding two branches base on a signal.